Where do you begin when talking about a highly talented individual like Norman Feuti? He is a cartoonist, author, and freelance illustrator. 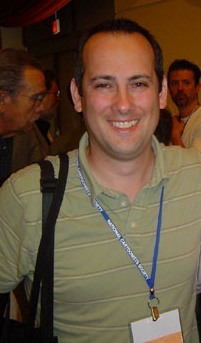 He started out as a manager in Retail and has turned that experience into a highly successful comic called “Retail”. He also turned “Gil” a rejected syndicate submission into a successful web comic, then pulled the plug on it, but now is launching that same comic into his second comic strip to be syndicated simultaneously. The man is a trooper and let’s hope he gets a little rest as he embarks on this fantastic new journey. David: Hi Norman, you have an array of talents from Syndicated Cartoonist, Author and Illustrator. Your very funny daily comic “Retail” features four main characters as they deal with the day to day life in a Retail store with customers and coworkers. You personally have worked in retail, obviously this has helped you develop your comic. 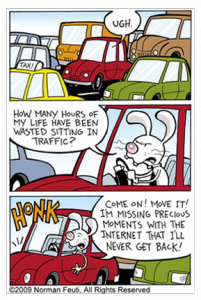 What is some of the background that lead up to you writing the comic strip, when did you decide to become a cartoonist? Norman: I’ve had a pipe dream of being a cartoonist ever since I got a copy of “Loose Tails” for my 13th birthday. It was the first Bloom County collection, and it really captured my imagination, and changed my perception of what a newspaper comic could be. Soon after, Calvin & Hobbes would similarly blow my mind. But the first time I actually tried to turn that dream into a reality was in 2000. I had been working in retail management for 15 years, and was burnt out on it. I submitted comic strip ideas to all the major syndicates regularly for five years before getting signed by King Features to produce RETAIL in 2005. RETAIL resonated with the syndicate because they felt my actual retail experience lent a great deal of legitimacy to the writing. David: You also have a comic strip called “Gil”. Can you share a little history and what is next with that? 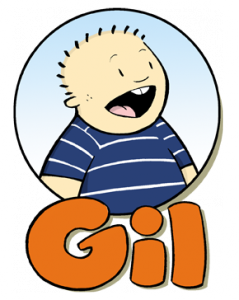 Norman: In 2008, I came up with an idea for a comic strip called GIL about a chubby 8-year-old boy with divorced parents. The strip wasn’t autobiographical, but was strongly based on my own experiences growing up. I pitched it to the major syndicates, but they all turned it down at the time for various reasons. After that I put the samples on my blog to get feedback and was encouraged by the strong response it got from my my fan base and fellow cartoonists. I turned it into a web comic and developed it further online for about a year before pulling the plug to focus on other projects. What’s next for GIL is big news for me actually. Last year, I resubmitted GIL with the new strips I developed online, and this time my editor at King Features said yes. GIL will launch in newspapers in January 2012. I’m very excited! David: I enjoy your comic “Nelson” designed for the iPhone, do have any plans to continue working with those characters and in that format? Thank you. A lot of people enjoyed the characters in that strip, as well as the format experimentation. It really wasn’t something the syndicates felt they could do anything with at the time, and frankly I’m not technically savvy enough to do something with it on my own, so I kind of shelved the idea for the time being. I don’t have any immediate plans to move forward with it. David: Having worked in retail management and now being a Syndicated Cartoonist (both can be demanding with management of time and resources). 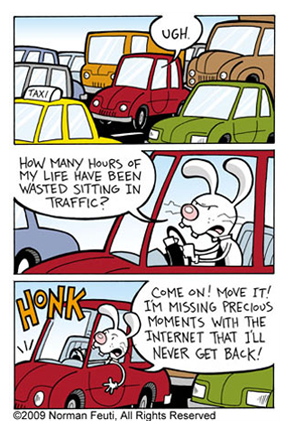 What do you consider to be the greatest reward of being a cartoonist even with a grueling schedule at times? Norman: The best part is being able to work from home and make my own schedule. Yes, the deadlines are never-ending, but drawing funny pictures for a living in the comfort of my own home is a pretty awesome way to make a living no matter how you slice it. David: What are some of the future plans for Norm Feuti, Retail and your other creative works? Norman: Well, as I mentioned, GIL is the next big thing I’ve got going on. But, potential projects for RETAIL keep cropping up as well. An agency in Hollywood is pitching it as a live-action TV sitcom. No takers on that yet, but the hook is out there. I’m working with a publisher to make a long overdue RETAIL treasury book a reality. I’m fairly busy these days. Which is a great thing! David: And it sounds like the planets are aligning! What a pleasure to feature you here on Don’t Pick the Flowers and have you answer a few questions. You have incredible work and I’m looking forward to seeing all that’s in store for us with “Retail” and “Gil”. This entry was posted in Interviews and tagged Art, Cartoon, Comic, comics, Don't Pick the Flowers, fun, Funny, Gil, Humor, Norm Feuti, Norman Feuti, Retail, Web comic. Bookmark the permalink.